This woman told how she lost over 150 pounds in one year! Jessica had been overweight her whole life but when she got a job near a fast food complex, her problem with excess weight got even worse. She was eating fast food several times a day when her weight reached 320 pounds. Then she realized that if she didn’t change anything, she would live a life full of pain and suffering. Jessica has created her own Youtube channel, where she tells everyone about her difficult weight loss journey. 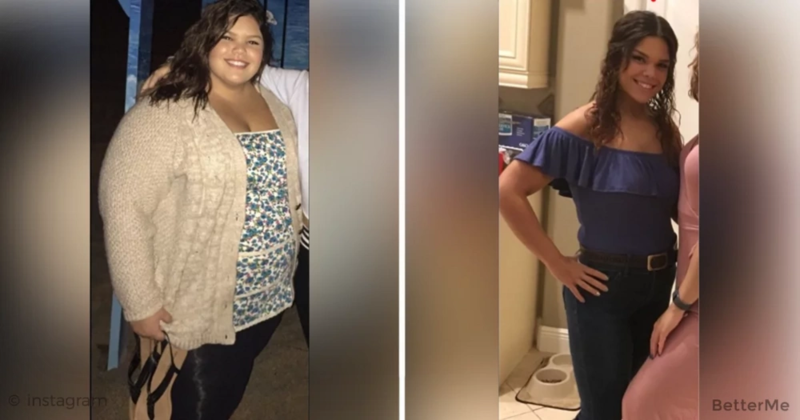 She shared her experiences about how she has lost 150 pounds of her extra weight and how she filled her life with positive emotions and happiness. In this article, you will find out about her diet, her training and her motivation. She was able to achieve this result in just 1 year! In February 2016 Jessica began her fight against obesity. She started drinking meal replacement shakes.The first 2-3 months she replaced 2 meals a day with the shake and ate one portion of food but then she decided to replace 1 shake with a healthy meal. After 5 months she stopped drinking shakes as she learned how to cook healthy food and how to portion it. She was sure that she would be able to slim down by just eating healthy foods. The first 2 months she consumed 1200-1500 calories on average a day, then she increased the calorie intake of her diet to 1500-1700 calories. As soon as she stopped drinking shakes, she started to walk a lot. Every day she walked more than 3 miles and after a month of training, she bought her first gym membership. She was embarrassed before her first gym workout because she thought everyone would laugh at her. The first 3 months she worked with a trainer: she only had 2 sessions each month but it was the most difficult challenge for her. After 2 months of gym training, Jessica noticed the first changes in her body. She decided to buy a scale to motivate yourself to continue losing weight. When people ask Jessica about her motivation, she answers them: “No one can want it for you, you have to want it for yourself”.